Holiday homes in Pattaya. Many come here to live and look to rent a house or a villa. Pattaya has many to choose from. 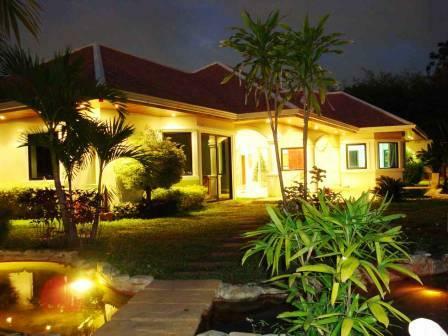 This page contains House and Villa rentals from around the Pattaya area. Some of the most popular house rentals are to be found in East Pattaya where there are many housing projects. House rentals on average start from 10,000Baht up. Yes you can get cheaper but not on this site. We also have a selection of short term holiday villas. with rental prices that include all the amenities and some owners including a car in the rental price. Luxury all inclusive rentals by lakeside locations or close to Jomtien beach many with private pools. We have a large five bedroom house that is described by the owners as "A party house" Ideal for a group of friends who want cheap accommodation and privacy. Large 6 bedroom house for rent Jomtien.